When painting nails of your children you need to lookout for the toxic trio: toluene, dibutyl phthalate (DBP), and formaldehyde. These components should not be in the nail polish and should be banned from any substance that comes into contact with humans, animals or plants. Toluene can be found in paint thinners, fragrances, and household cleaning products. Repeated or prolonged exposure can damage the nervous system, irritate your eyes, and it has been known to affect the upper respiratory system including the throat and lungs. Dibutyl Phthalate is often referred to as the reproductive toxin as it has been linked to development problems and birth defects. Europe has banned its use in cosmetics manufacturing since 2003. Formaldehyde works as a nail hardener to ensure painted nails don’t chip. Exposure to this chemical over time has been known to cause respiratory problems and can increase the risk of certain forms of cancer. It’s a known carcinogen. Our indoor air quality is a concern for children with allergies, asthma, and chemical sensitivities, it’s important to be in a safe place. In a nail salon you will constantly inhale and absorb known irritants and therefore it is not a safe place for especially children. The air inside a nail salon is so saturated with fumes from chemicals evaporating from polish, polish removers, nail hardeners, and adhesives, and into the air. And this isn’t only while chemicals are in use, but even after they are thrown away, as cotton balls and open containers continue to emit fumes from the trash can. Should you decide to engage in painting children’s nails by bringing them to a salon, you’ll want to ensure the facility you visit has proper ventilation to dissipate chemical-laden vapors. 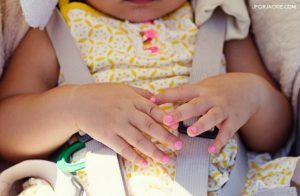 Or if you’re painting children’s nails at home, you may want to do it outdoors or on a well-ventilated porch and certainly with a nail polish that is “safe” to use. In conclusion everything enjoyed with moderation as we know is the best way to go. Assuming your child isn’t “sniffing” on the bottle or chewing on their nails all day, once in a while, you may feel okay indulging with your little one at a mini spa retreat. However, since there is very little research on this particular scenario, and we are very aware of risks of toxic chemicals, poisoned air, and UV exposure in these environments, it’s probably best to avoid taking your child to a salon unless there is excellent ventilation, safe nail polish options, and your nails are naturally air-dried. And to top it off of course the salon uses the so called Non-toxic nail polish brands. All content found on the healthandimagecoaching.com Website, including: text, images, audio, or other formats were created for informational purposes only. The Content is not intended to be a substitute for professional medical advice, diagnosis, or treatment. Always seek the advice of your physician or other qualified health provider with any questions you may have regarding a medical condition. Never disregard professional medical advice or delay in seeking it because of something you have read on this Website.